With all the Superbowl coverage from this past weekend it reminded me of my stay in Indianapolis back in 2002. I was there for a 2 day weekend on a business stay and had the pleasure of seeing Indianapolis fantastic downtown. I also had the pleasure of staying at the Westin. The Westin is a 4-star hotel that was built in 1989. It has 573 rooms priced from the upper 100's to the lower 300's depending on what room you'd like and when. According to the Westin themselves, "The Westin Indianapolis enjoys an unbeatable location in the heart of the city. Connected by a covered sky-bridge to the Indiana Convention Center and Circle Centre Mall, guests have access to everything they need, whether traveling for business or leisure. We are only a short walk from area attractions like Lucas Oil Stadium, Conseco Field House, Victory Field and the NCAA Hall of Champions." Back to me. 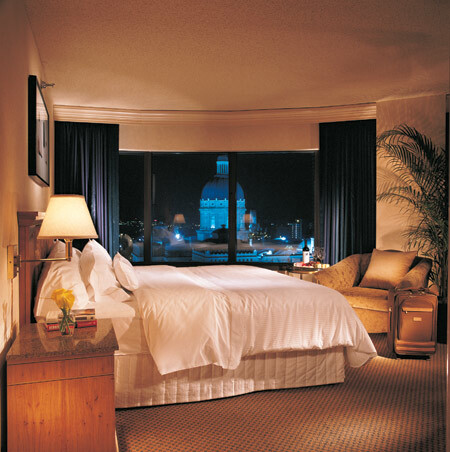 I enjoyed the stay and my room had a killer view of the capital. I found myself hitting the hotel fitness center during the day and walking downtown at night. I even set my foot in Lucas Oil Stadium, the home Peyton built. Check them out at: www.westin.com/Indianapolis, where they might even have specials running now that the superbowl, and perhaps Manning, are leaving town.